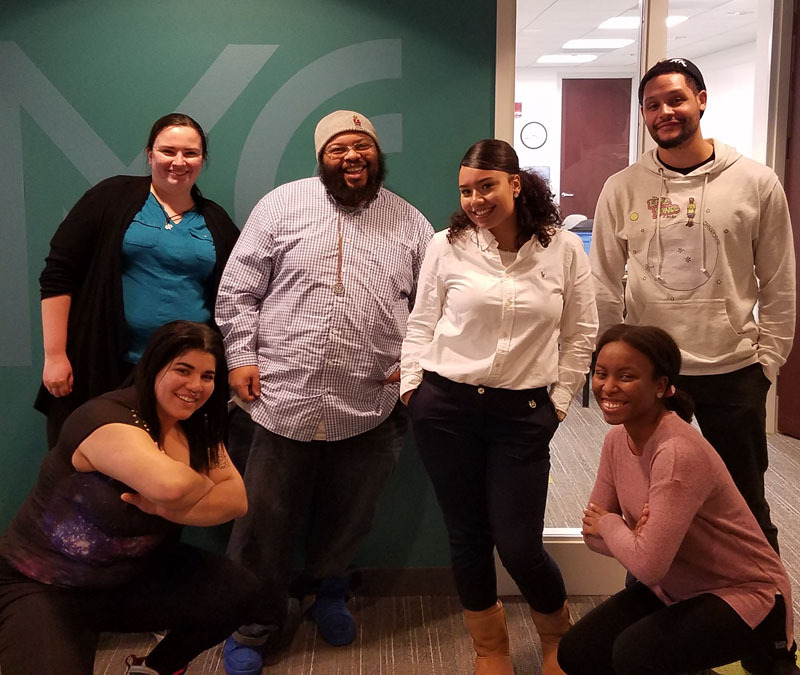 For the third year in a row, Mass Cultural Council is proud to award 15 Amplify grants totaling $15,000 to projects designed and executed by young people in programs receiving YouthReach or SerHacer funding, furthering the Commonwealth’s investment in youth leadership and empowerment. This year the Amplify process not only encouraged young people to design and lead their own projects for their communities’ benefit, but also included young people and program alums into the evaluation panel. This unique panel worked with impeccable professionalism to ensure that proposed projects had the right balance of quality, innovation, and youth involvement, and thrived in the opportunity to have a voice in how these funds are helping programs across the state. Thanks to our 2018 Amplify panelists: (Left to right) Gladys Hidalgo, Raw Art Works; Rachel Cummings, Express Yourself; Corey DePina, Zumix; Raquel Navarro, Sociedad Latina; and Marquis Victor, Elevated Thought. With Shaneez Tyndall, Mass Cultural Council. A conceptual dance project demonstrating and addressing social issues present among young teens such as bullying, body image, and cultural differences. The dance will be performed at the Wake up the Earth Festival and Dance for World community. Youth will experience a career exploration of the fashion field learning how to create and put on their own photo shoots, design and construct custom made clothing using fabric materials and equipment, and publish a magazine highlighting their efforts and successes throughout the year. Teen facilitator Andrine will plan the curriculum through 2017-2018 and execute monthly lessons and a series of creative writing workshops for teens and preteens in coordination with Books of Hope and Mystic Learning Center staff and administration. Through music and illustration, the tour choir will compose works of art that visualize ‘what music means to me.’ Members will use various mediums to personalize their work which will be presented to the choir, photographed and made into a banner which will be displayed at local cafes, Boston Public Library Dorchester, and the Strand Theater. Through a series of hands-on workshops, students will use Vocaloid – a software program which enables users to synthesize “singing” – to learn about vocal synthesis, music production, animation, and creative collaboration through the creation of original songs and music videos. Students will create the Port Art blog to document stories, articles, videos, updates, and personal podcasts focusing on two community needs – the important role of arts in Cambridge and youth voice. The blog plans to engage 150 teen contributors. Falling under Elevated Thought’s ‘Nature of Home’ focus, the documentary project ‘Immigrant Narratives’ will capture immigration stories of members of the community. Stories will come to life through camera interviews, photography, and interpretation of these narratives through poetry. Designed by leaders of the Youth Truth performance ensemble, ‘Sharing our Truth’ is an abbreviated performance of the Youth Truth script. The project will spread awareness of teens experiencing out of home care and teach peers how to support these students. Using the Storytelling Project Curriculum created by Columbia University, students will learn about race and racism and consider how diverse stories can make a difference. Each student will share positive personal stories of living in Lawrence and redefine the media’s narrative on the Lawrence community through art, writing, and performance. Ritmo en Accion youth leaders will collaborate with the music and theatre youth teams to adapt Afro-Latin folktales into a public performance to share with the community. Students will work with project scholar Dr. Lorna Rivera and other content specific experts to ensure the authenticity and relevance of the dance to the folktale’s culture of origin. Students will perform original compositions along with accompanying visual and written components guided by the theme of “The Berkshires” in which students will explore a location, event, or feeling associated with living in the Berkshires. Apprentices will create an exhibition at the Museum focusing on New Bedford’s first black photographer, James E. Reed. Students will explore who James was, learn about the history and business of photography and explore the history of the city of New Bedford through the eyes of the photographer. The final exhibition will showcase original work by the apprentices as well as provide access to materials in the Museum’s collection including the original cameras, backdrops and photographs of James E. Reed. Five workshops taught by 10 current Art Reach student-artists with focuses on dry point etching, painting, color theory, writing and character development, and life drawing will be presented to the public over the weekend of May 12-13, 2018. This is an intergenerational project allowing Art Reach students to showcase lessons from PAAM and an opportunity for adults to learn from the younger generation. The project will provide income to student teachers for curriculum planning and teaching/co-teaching as well as a platform for creative leadership in the community. Students will work with an artist to explore social justice issues and design a mural for the WYC building in a 7-week creative expression program. A culminating event will be held in which youth and the community will paint the mural over a recently demolished portion of the WYC building. Students will have the opportunity to work in a studio to record chamber music which can be streamed online and visit WCATV to talk about the program and perform live on television. This project will bring classical music to populations who don’t normally hear or have access to it (i.e. nursing homes).